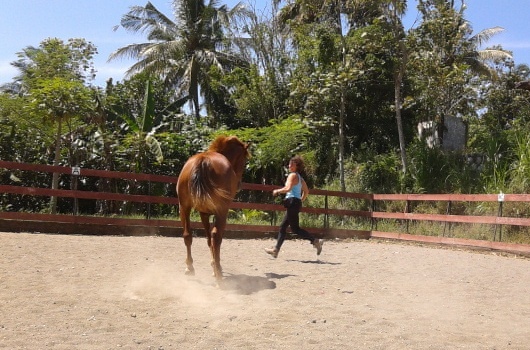 You can bring your horse to Havana Horses for boarding and training on a month-to-month basis. Your horse will live in the herd on pasture/paddocks day and night (see Natural horse keeping). If your horse used to live in a stall, you will find that in the first few months it will loose weight because of the opportunity to move freely and roam and play day and night. If up till now your horse was fed on prefabricated horse feeds, it will need some time to adapt to the natural diet at Havana Horses. In general the horse’s intestines recover their natural balance in a few months. That is why all horses become friendly, relaxed and easy-going at Havana Horses. Does your horse suffer from ‘stable vices’, like rubbing its tail, cribbing, weaving, biting or any other symptoms of boredom and stress caused by confinement? These problems will be gone in a few weeks after boarding at Havana Horses. 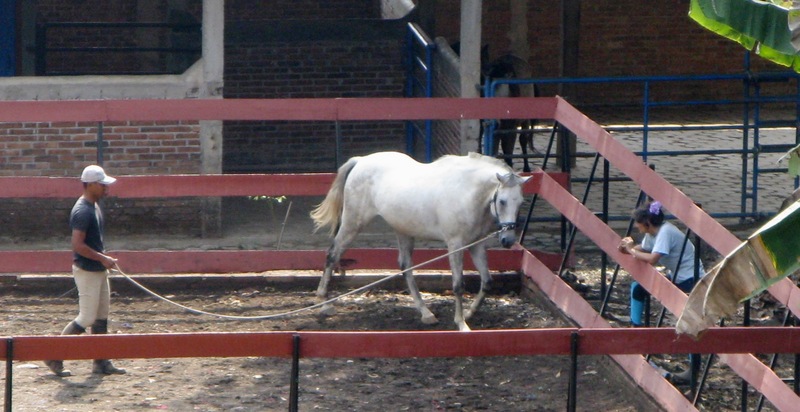 As all our horses go barefoot, prior to boarding at Havana Horses your horse’s irons should be removed. Natural hoof care is included in the contract. In agreement with the contract your horse will be trained with natural horsemanship and straightness training methods without the use of any force. 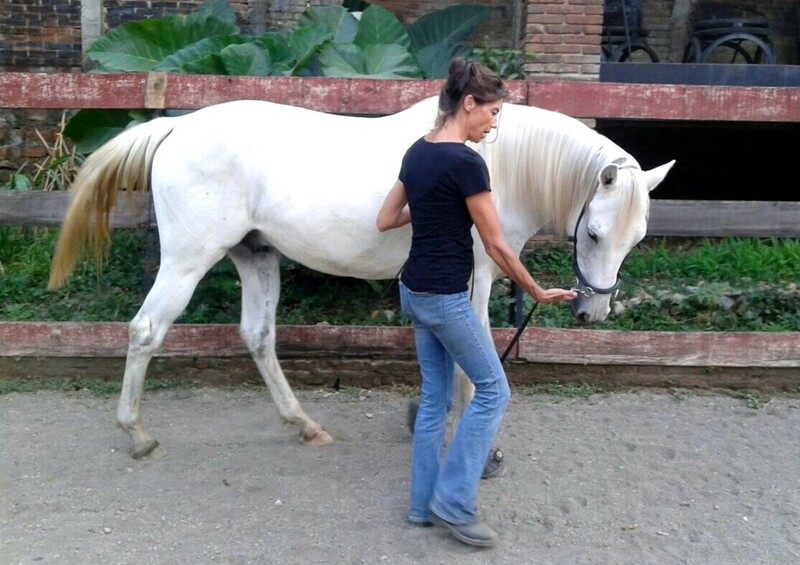 The elementary training as mentioned in the boarding contract below, consists of daily purposeful handling by Havana Horses’ trainers, in addition to longeing with the half-halt, liberty training, groundwork and natural riding basics. Additional training sessions may also include work on the long lines, and, in agreement with your horse’s level of development, basic or advanced principles of classical dressage. Also jumping skills can be included in the training. We at Havana Horses are always studying, (re)reading the old masters, learning and developing ourselves and our horses. At the moment Anna is a mastery student at Marijke de Jong's Straightness Training Academy, learning how to help horses to carry themselves in a more straight and thus balanced manner, in order to be able to carry the rider better. Of course your personal wishes and specifications can be discussed and included in the contract.Contact us for more information. Havana Horses welcomes guest trainers from all over the world who are adept in natural horsemanship, the art of classical riding and/or classical dressage to spend time with our horses and exchange ideas and training methods. We had the pleasure of Cecile Devaux, French horse trainer adept in natural horsemanship, visiting us from 2010 till 2014. With her gentle and extremely patient nature she succeeded in cooling down the excited horse, giving the nervous horse trust, and starting the excited young horse to become a calm and trustworthy riding horse. Although Loesanna Lagerwaard's visit in 2014 to Havana Horses lasted only three days, during these three days she gave us a tremendous boost in our development in classical dressage training. With her enormous expertise and brilliant experience - she was part of the selection for the Olympic Dutch team in the 70's - she gave us excellent instruction and the tools to develop us and our horses further. When in April 2016 we paid her stable in Germany a visit, she gave us the chance to ride with a ladies saddle, a very special and inspiring experience. Moreover, she arranged for us to get instruction from a jury member of the Barcelona Olympic Games. What a privilege and how valuable that lesson was for us! Serena Starchild came to Havana Horses in November 2012 and introduced us to the work of Henri Gerard-Bouzar (see Library) and his method of longeing and training with the proper, as the old masters have intended, use of the half-halt. Each and every day we, and our horses, harvest the fruits of her very intense training sessions during four days with us in Salatiga.